David Fumero was born in Havana, Cuba and raised in Miami until he was eight, when his family again relocated to New Jersey. After high school Fumero joined the Marines, but due to two ankle injuries, he decided to leave active duty to study engineering at a Miami college. While there, a former girlfriend suggested he give modeling a try to earn extra cash for school. Eventually, balancing his studies and modeling became too much and Fumero moved to New York City. Shortly after, he headed to Paris for two years. While he was there, he decided to take some acting classes. He ended up having a healthy dose of success as a model, appearing in print ads for Jean Paul Gaultier, Christian Dior and Versace. He moved from Paris to New York in 1998 after he was hired to place Cristian on ONE LIFE TO LIVE. He's taken a few breaks from the show over the years to do some film work and audition during pilot season, but always found his way back to Llanview. After all, it is where he met his wife Melissa Fumero (ex-Adriana, OLTL). Appeared in Mariah Carey's 1997 music video for her song "Honey." His hobbies include painting, motorcycles and fishing. He has a 115-pound French Mastiff named Bella. Co-star Mark Lawson (Brody) is his workout buddy. He appeared as a detective on OLTL 10 months before the role of Cristian came up. Melissa and David Fumero (ex-Adriana and Cristian, ONE LIFE TO LIVE) welcomed a son, Enzo, on March 24, reports People exclusively. 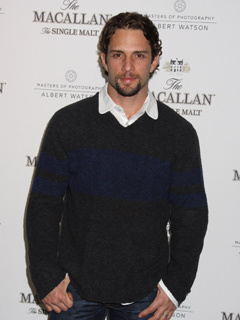 David Fumero, who played OLTL's popular Christian Vega from 1998-2011, has booked a role on season two of the Starz series POWER, reports Deadline.com. Marcy Rylan (Abby, Y&R) will co-star with Captain Kirk, er, William Shatner when she makes a guest appearance on his hit sitcom, $*#! MY DAD SAYS, airing February 10. In the episode, Rylan will play Rebecca, an old acquaintance of Henry's (Jonathan Sadowski).